The Lower Devonian Rhynie chert is famous for its rich detail, mostly due to fossil plants but also to creatures and mineralisation phenomena. Some of the structural features are conspicuous owing to enhanced contrast from black or dark stains, coatings, or linings. Hollow straws of Aglaophyton with clearly seen dark cell walls, or what appears to be such, are rather common (Fig.1). The hollow straw aspect had been explained as a result of silicification penetrating into a limited depth [1,2], a view which has been doubted in . 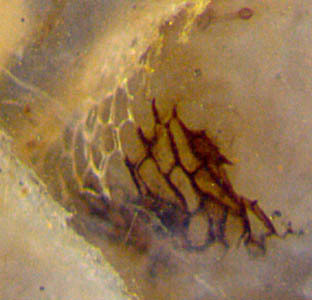 A characteristic tube inside the rarer plant Ventarura (Fig.2), likewise consisting of tissue with apparently thick and most often dark cell walls, had been regarded as sclerenchymatic . Contrary evidence has been provided:  and Rhynie Chert News 60, 66. The usually inconspicuous cuticle on the epidermis of land plants is occasionally covered with a pale layer which may turn black and thus make clearly visible contours of plant sections (Figs.2,3). The cuticle with (stained) coating can become detached from the degrading plant and deform under residual stresses, thereby making curved shapes (Fig.4). Other curved shapes not related to biological structures arise from linings of former swamp gas bubbles which later became filled with water and silicified (Fig.5). The transition from pale to dark or black can be smooth or rather sudden (Figs.4,5,7). 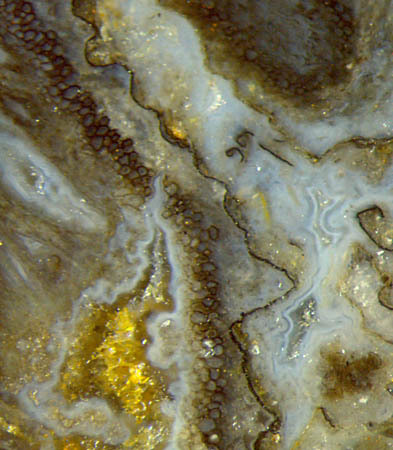 Since there is fossil evidence indicating that the dark appearance is not merely a stain of the very wall or cuticle matter but is due to some added layer which can also be pale, a microbial involvement suggests itself. 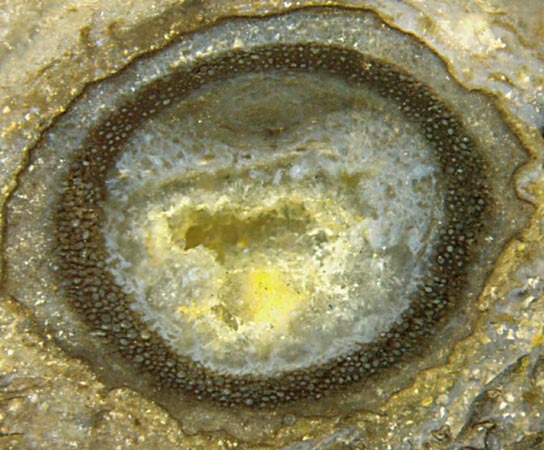 Fig.1: Aglaophyton "hollow straw", 2.2mm, tissue mostly decayed except for a black-stained tube adjacent to the poorly preserved epidermis. 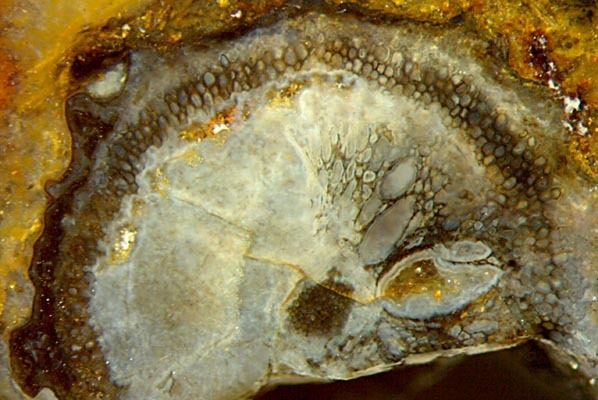 Fig.2: Ventarura, characteristic aspect with shrivelled contour and well preserved hollow cylinder mimicking sclerenchyma, other tissue decayed. Width of the picture 5.5mm. Fig.3: Two Ventarura sections: shrivelled contour with black stain (left) and without or pale stain (above right). Width of the picture 2.5mm. Fig.4 (connected to Fig.3 on the right, enlarged): Detached fragments of coated cuticle, deformed by residual stresses, with pale coatings partially stained black. Note the long continuous patch of cuticle in the lower half of the picture, extending beyond the frame below, with the transition between pale and black varying between smooth and sudden. Note also the dimly seen crack in the chalzedony below, which chooses the mechanical discontinuity provided by the cuticle for an easy path. Width of the picture 1.5mm. 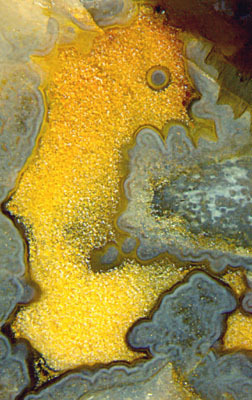 Fig.6: Ventarura, rare case of abnormally grown inner tissue, preserved and stained dark. Width of the picture 4.3mm. The cross-section in Fig.6 is rather peculiar and deserves a special comment. 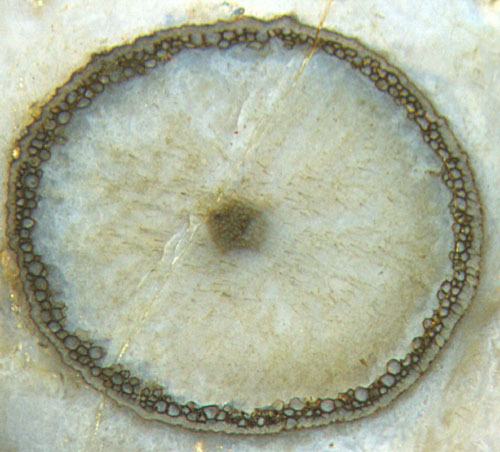 The shrivelled circumference, the vanished adjacent tissue, the dark ring of conspicuously preserved tissue, the vanished tissue inside, and the central strand are the usually seen features of Ventarura. What is quite unusual with this particular specimen is the cortex tissue on the right half, grown in a misguided way and being distinctly seen owing to dark stain. Similar misguided growth, probably due to the influence of fungi present in the live plants, is found in several other species of early land plants, as discussed in Rhynie Chert News 4, 21, 54. In the present case the fungus (?) did not only cause the plant to grow disproportionately big cells which might have become voids. Apparently it also made the affected part of the tissue decay-resistant so that there was enough time available for a dark stain to settle on the cell walls before silicification, which makes the smaller ones of the affected cells resemble those of the characteristic (dark) ring. 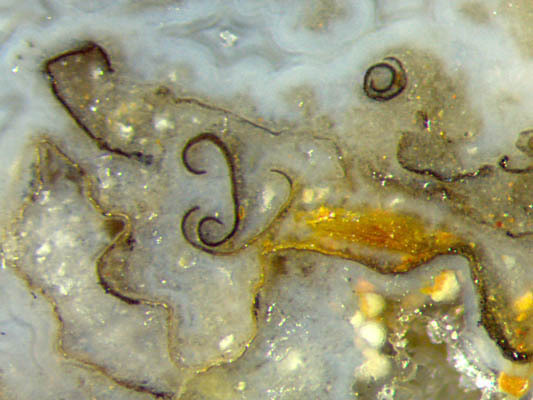 Fig.7: Curved patch of epidermis surface of unidentified sporangium with sharp boundary between pale and dark brown. Width of the picture 0.65mm. Several observations indicate that dark coatings can become bleached by oxidation of the carbonaceous decay products of the organic substances so that they look similar as in Fig.7. The oxygen can enter by diffusion through the chalzedony. Hence, there is the additional uncertainty that pale coatings can be bleached or originally pale. The observations illustrated here and in Rhynie Chert News 60, 66, 87 suggest that the various dark formations, or part of them, may have something in common. - Deposits on cell walls, cuticles, and former silica gel surfaces in Rhynie chert are often of microbial origin. - The aspect of the said deposits can vary between pale and black. The deposits may escape notice when overall pale. - The said deposits had been formed only on substrates that had persisted in water long enough. - Tissue degrading early had not become coated. - The rings of Aglaophyton "hollow straws" and of Ventarura are due to cell walls made decay-resistent in the live plant. - The said rings are conspicuous because of both their mere persistence and the pale or stained cell wall coatings. - The coating is not strongly bonded to the substrate but may become reduced to detached flakes. - How do parts of tissue acquire such decay resistance that they persist among decaying tissue and get coated cell walls ? - Which aquatic microbes form coatings on persistent substrates ? - How do the coatings become stained ? A. Channing: Processes and Environments of Vascular Plant Silicification: Thesis, Chapter 6, Cardiff University, 2001. European Palaeobotany and Palynology Conference 2014, Padua.